The Urban Group review of 2017 concluded with the expectation that the Group would be disbanded and the hope that the Civic Society would take on responsibility for continuing the good work. I am delighted to report that in fact the Urban Group has been given a new lease of life with a combination of old and new members full of enthusiasm and commitment to maintain, enhance and improve our marvellous town centre. I have recently taken on the role of Chairman of the group following the excellent start given by David Taylor. We are joined by previous members Graddon Rowlands and Paddy Jelen together with new members Steve Marsh, Tim Lee and Duncan Lingard with two further new members currently poised to join the team. The Group has been very active during the year with a combination of projects, researching and lobbying with varying degrees of success. 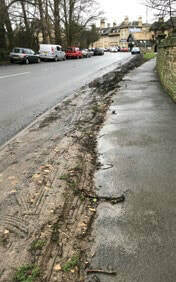 Over a long period of time we have been in dialogue with Lincolnshire County Council Highways, Burghley Estate and others to resolve the problem of parking on grass verges and pavements and the extensive damage caused. Our group fixed temporary notices in the verges and leafletted vehicles to discourage inconsiderate parking. 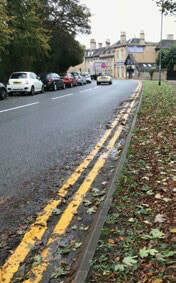 Recently LCC has at last painted double yellow lines on the East side and we anticipate the imminent fixing by Burghley of permanent timber bollards in the West verge. The Group was keen to create a “flagship” project for the year and saw the green riverside area along Water Street as an ideal location for a landscape enhancement project. Extensive preliminary research and discussions with the relevant authorities and experts took place and an initial design idea formulated in readiness for public consultation. Unfortunately our ideas were not deemed acceptable by sufficient local residents and the project was cancelled. Hopefully this area may be re-visited in the future. Members will have noticed that the carriageway across Red Lion Square is in need of attention. The Yorkstone setts were laid in 2007 but the lack of simple and inexpensive maintenance by periodic brushing of fine sand into the joints has resulted in lateral movement and fracture of a number of setts. This is the sole reason for the problem, not the design which is more than adequate and appropriate for the location. The situation is easily remedied by removal and re-laying of setts, replacement of broken setts and regular sanding of joints. Despite this we understand that LCC are considering removing and disposing of all of the Yorkstone setts and re-surfacing the carriageway with black tarmac. This would be very costly and wholly inappropriate on safety, aesthetic and conservation grounds. The Civic Society is determined that this should not happen and the Urban Group is actively lobbying all appropriate groups and individuals accordingly. Now protected by yellow lines. We are in the process of arranging permissions and funds to floodlight the East elevation of St Michael’s Church building and are in discussion with the Town Council and other churches about similar floodlighting possibilities. With help from Urban Group members and in particular Duncan Lingard carrying water by bicycle from the river the olive tree seems to be making a strong recovery! We are grateful for the help and advice given by John Parrott of the Olive Grove at Oundle. These include: new street lighting in Horseshoe Lane to complement new lights in Red Lion Square; new and improved visitor signage throughout the town centre; a new survey of cracked, broken and dangerous paving which is now widespread and needs urgent attention; and the enhancement of the southern paved area of Sheepmarket together with attractive permanent bollards to prevent parking.